During the early 1970's, not long after the EAA moved their big convention from Rockford to Oshkosh, the gang of malcontents that hung around our little airport in Buckhannon discovered EAA Oshkosh. Once they attended their first convention they were hooked on the great gathering and became such fans they would usually start planning for the next year's trip during the flight back from this years event. A week of gleaning memories under the big Wisconsin sky always provided enough airplane discussion and arguing fodder to get our office's daily assemblage of loafers through the year until it was time to do it again. Although I was running the little airport, I counted myself as part of the group of aero nuts that would rather talk about airplanes than eat when we were hungry. I was just as eager as the newest student pilot to visit the assemblage of all things aeronautical that graced Cheeseland in summertime. Remember, we were country kids and our exposure to airplanes that were extraordinary, was for the most part limited to what we would read about and see pictures of in flying magazines. All at once the trip to Oskosh provided the real thing, acres and acres of antiques and fighters and biplanes and bombers and homebuilts. I for one, found it more intense than I could find the words to express. It took my breath away. Anyway, for several years, come summer it was Oshkosh by Gosh for our group. 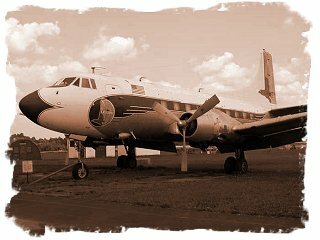 There were many memorable trips in various airplanes the first of which was the infamous flight in the Cherokee Six with a load of my students, when, lacking the needed Sectional where Oshkosh was located, I landed at Fond du Lac while talking to OSH tower, much to my eternal embarrassment. There was the year we went in a Martin 404, owned by a friend of mine, who, ruing that he had missed the era of round engines flying and having a passion for big radials, bought a 404 and started a travel club. I remember arriving in the big airplane, an airplane giant in a Lilliputian aircraft world, and here came Paul Poberezny himself, mad as a hornet and yelling because we had dented his grass. After the excitement died down though, I remember feeling very smug about being the only campers with an upstairs bathroom. The journey to OSH that is strongest in my memory though, is the one that took the longest to travel the six hundred or so miles from West Virginia to Oshkosh. As I recall It was eleven hours in our J-3 'Sundance', in the company of four other delightfully old and slow airplanes, a mix of Cubs, Champs and an Aeronca Chief. A friend of mine owned the other J-3 and he had just overhauled the engine and although he couldn't make the trip, he thought it would make an excellent run in for the engine, so he volunteered the ship to accompany us if I could find a pilot for it. I did find one, sort of, in the person of my old buddy Larry. While an experienced pilot, Larry was a little short on taildragger time. Very short in fact. I think it was Bob Hoover who once proclaimed the J-3 to be the safest airplane ever built. "It can just barely kill you" he said. With that in mind I handed the Cub over to Larry, along with my brother in law, The Moose, a non flyer who would be taking his first trip to Oshkosh. well, a splayed look about it. Larry was a big man, and The Moose hadn't earned his nick name by being petit, and we were going camping of course, so there was that gear stuck in the few empty cubic inches of free space that remained inside their airplane. At that point though, the situation was similar to the Freight Dog's credo of 'why check the weather, you're going anyway'. I tried not to think about it. Once airborne, flight was a pure delight, with the five old airplanes spread across a summer sky in a loose and comfortable formation. I was elected leader of the formation, not because of any skills I possessed, but because Sundance had apparently come from the Piper factory with the optional 10 knot built in headwind. It was the slowest of the formation, so in order not to lose me everyone throttled back and flew on our ship. It was at our first fuel stop at Zanesville, that we began to notice a problem. As we taxied in for fuel, I, the ever conscientious flight leader, counted our aircraft. One was missing! As we piled out of our airplanes there was a mighty roar and Larry burst from the weeds on the north side of the runway where his ground loop had deposited him, taxing to join us and trailing debris from his expedition. Of the five stops we made for fuel on way to Oshkosh Larry ground looped three of them. As we learned that these ground aerobatics didn't seem to harm the airplane, it became a perverse form of entertainment to see where Larry and The Moose ended up. The Moose, a man of few, actually of almost no words, was asked at a fuel stop how he was doing, said in one of the longest sentences I had ever heard him utter, "my head is killing me". Over the open and rolling corn fields of Indiana we slowly bled off altitude until the tops of the tasseled corn tickled our tires, and we made slow, sweeping turns to avoid farm houses and barns as the sweet smell of summer caressed us through the open side of the Cub. Life at that moment was very, very good.